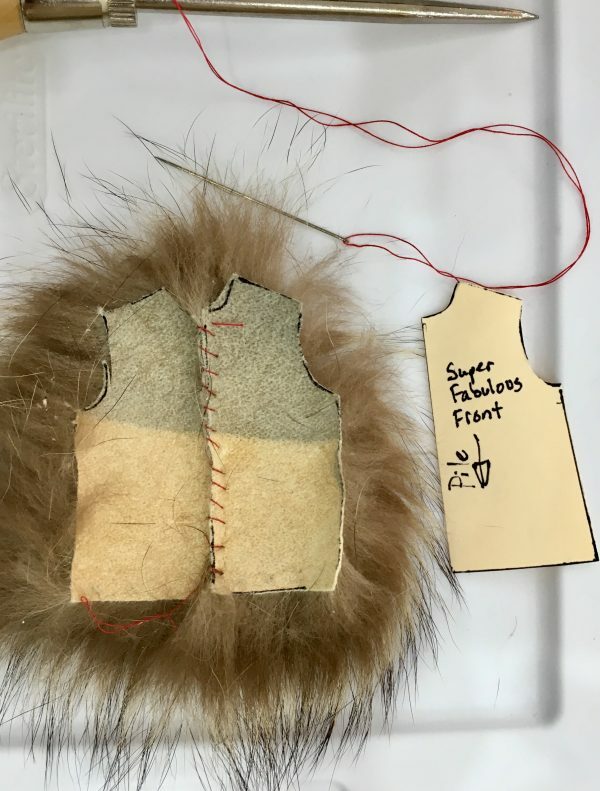 When you are cutting fur, whether you are working with actual hides or faux fur, you want to make sure you aren’t using scissors or rotary cutters if you can possibly help it. 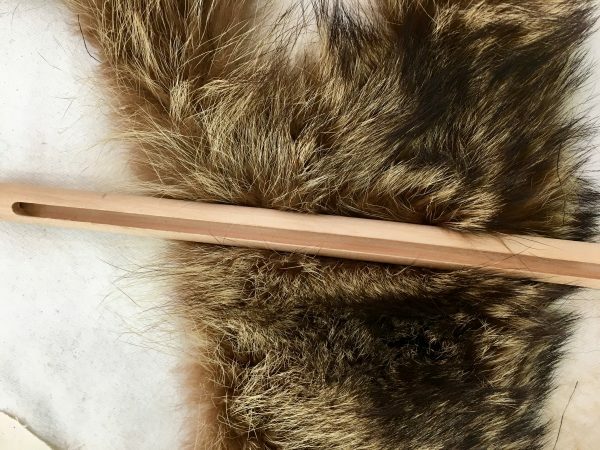 These are going to cut too much of the fur pile off – that leaves you with a mess and keeps your seams from looking professional. All professionals know that the proper tool to use for cutting fur or faux fur is a laser cutter like this: Boss Laser Cutter. Heh. Just kidding. 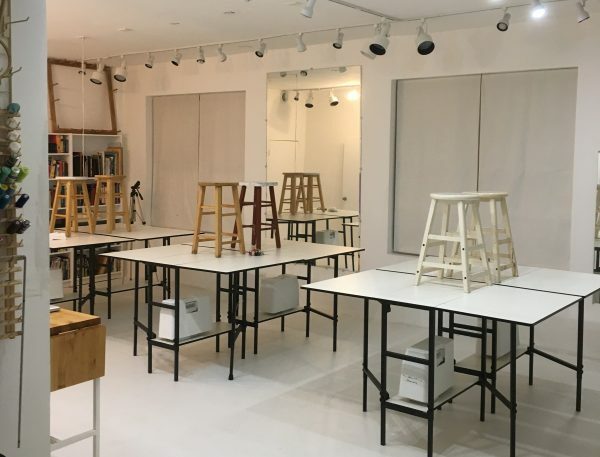 You don’t need to spend US$24,000.00. You just need to go to the grocery or hardware store and pick up a package of single edge razor blades. You can also use an Exacto knife if you are feeling fancy and a surgeon’s scalpel if you are really high-class. We’re vaguely pedestrian and terribly earthy here, so we will be using a razor blade. Tchad spent some time when he was a kid with the elderly owner of a local fur storage and restoration business and picked up more than a few things. 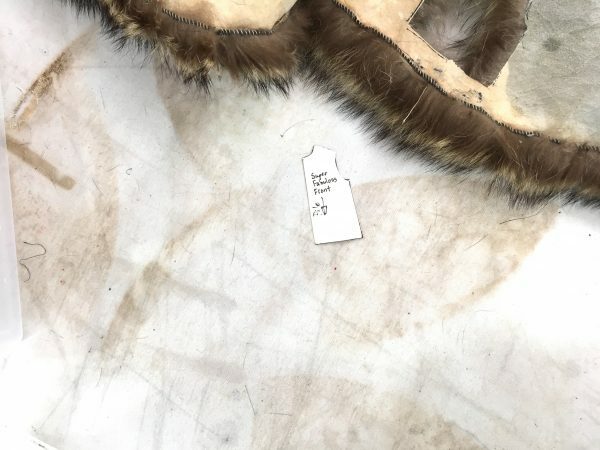 Here’s the way it works: You trace on the pattern to the back of the hide or the wrong side of the faux fur. 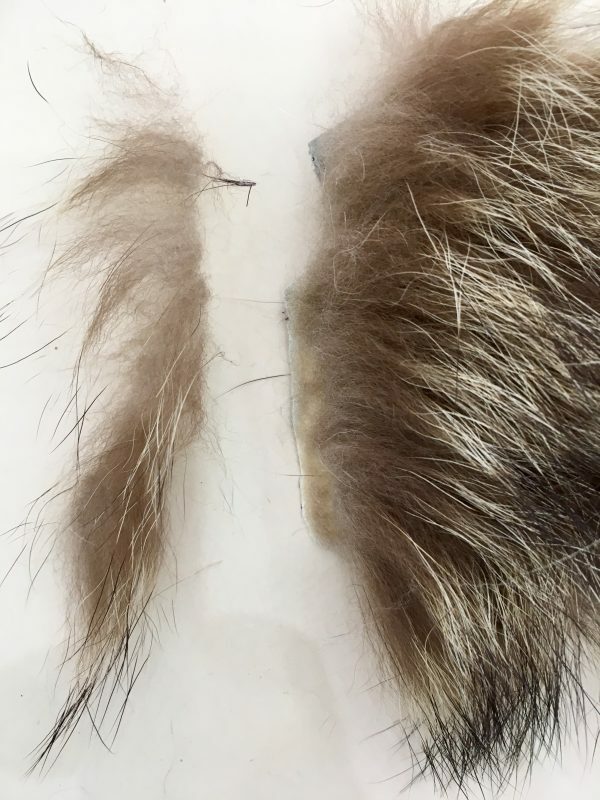 If you are using real fur it is easier because the ground you have to work on is smoother. We are doing this in sharpie for the demo. Generally, it would be with a tailor’s chalk, soft graphite pencil, stiletto wheel, or chalk pencil. Your mileage may vary. 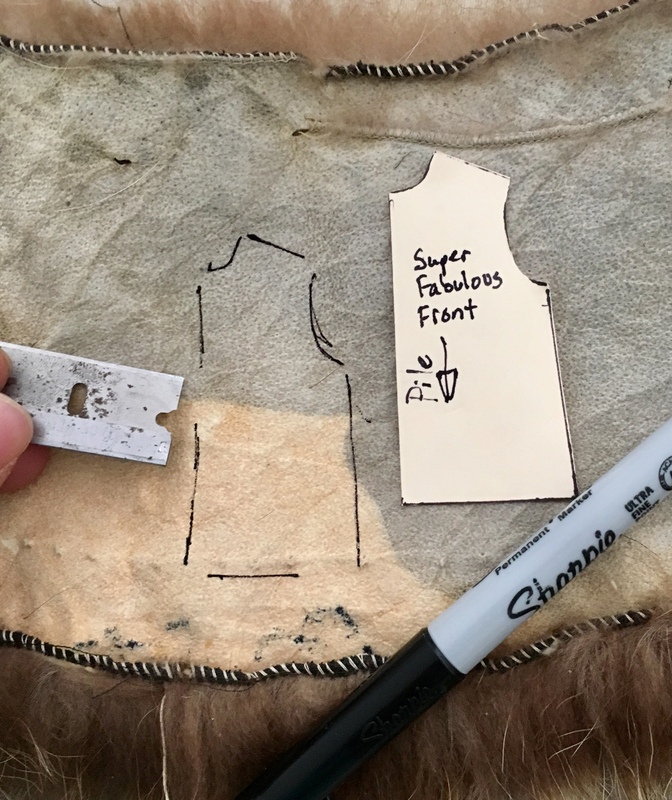 Once this is traced, you will take the razor blade and carefully cut the piece(s) out from the back or wrong side – being careful not to cut into the pile on the other side. Think of it like you would approach surgery – you use the sharpness of the blade to cut only as deep as you need to. You don’t press; ideally the blade should never go deeper than the hide or fabric backing. 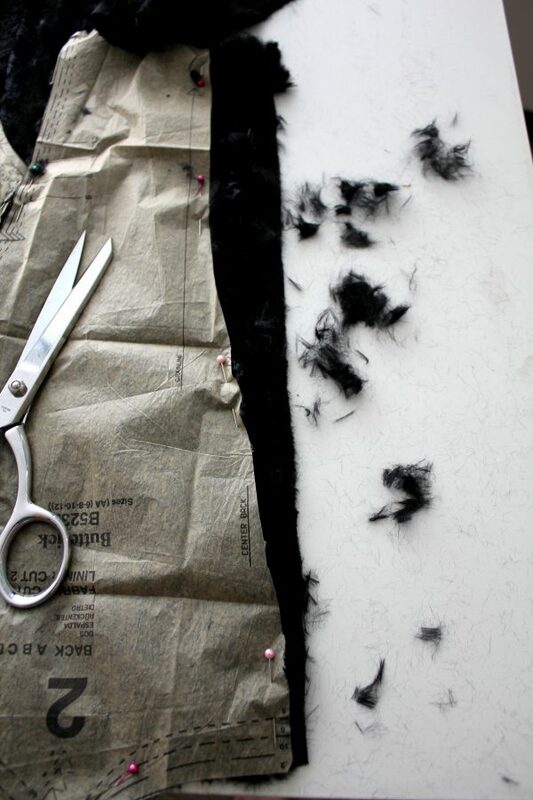 Once the piece is cut, you gently lift it out of its place, teasing the fur so that it doesn’t tangle or tear. Another way to do it is to use a daubing rod or dowel to create a channel in the pile then cut with a razor blade or rotary cutter, but this is only a compromise between flat rotary cutters on a table and a razor blade worked from the back. If you are cutting it this way, work the rod or dowel through the pile to create something of a channel in it. When you are ready to sew it, gently comb the pile back so that you are working with as smooth of an edge as possible to match up the sides. We highly recommend basting this with a whipstitch before sewing it. 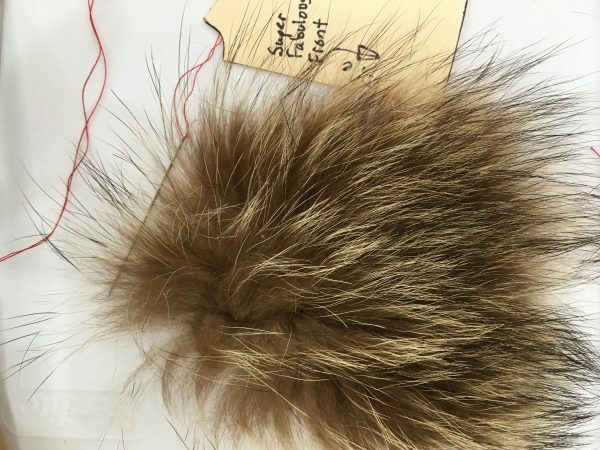 If it is real hide, then do a fine whipstitch, blanket stitch, or some variation on a fagoting stitch for the seam itself instead of using a regular sewing machine. If you have access to a fur machine like a Singer 46 series, all the better. 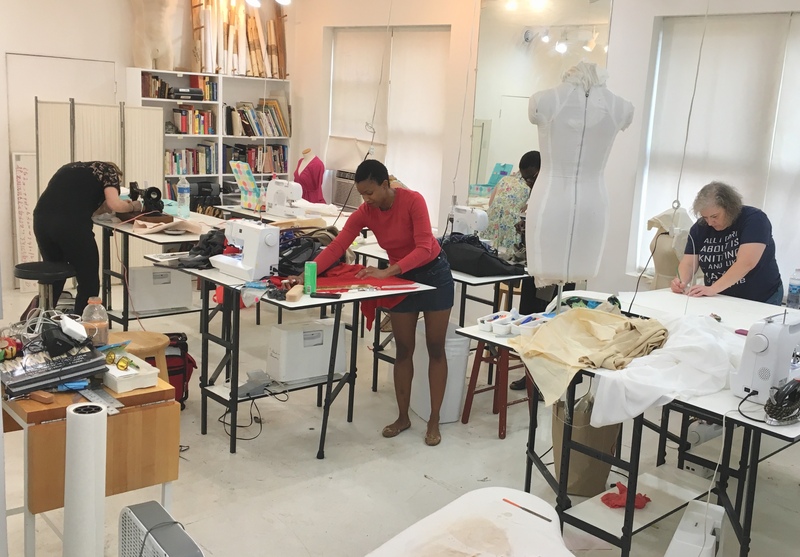 If you want to use a serger, it should be done with one needle, not two, the stitch length should be as long as possible on most modern machines; the blades should be disengaged. 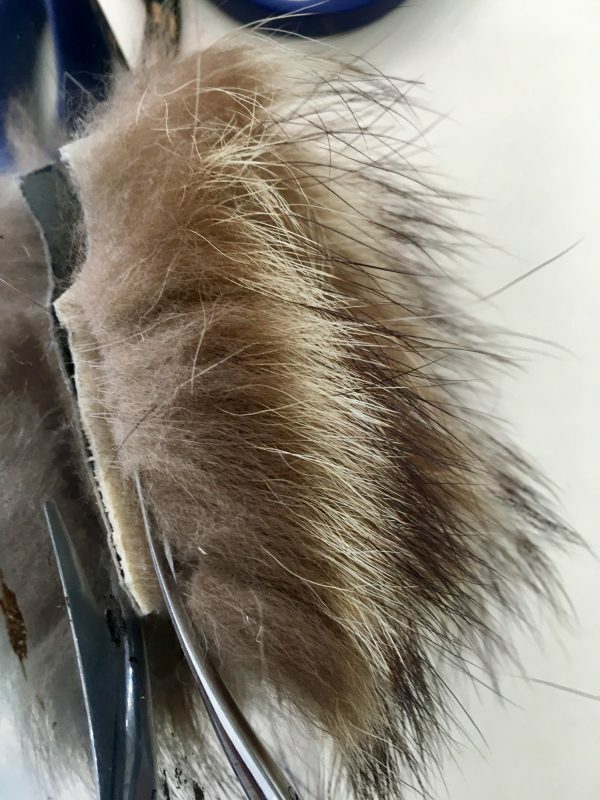 If you are going to be using a sewing machine, set your stitch length a bit longer than normal – maybe around 3.5-4mm – higher on denser furs – and don’t push it through. If you have combed the pile when you set it up and basted with a whipstitch, you should be fine. Keep your seam allowances manageable – you don’t want something too narrow under a regular sewing machine foot or it will tend to slip. If you have a guide that mounts to the foot itself, even better. For our little mini-sample here, we just used a quick slapdash whipstitch (don’t you dare judge us). 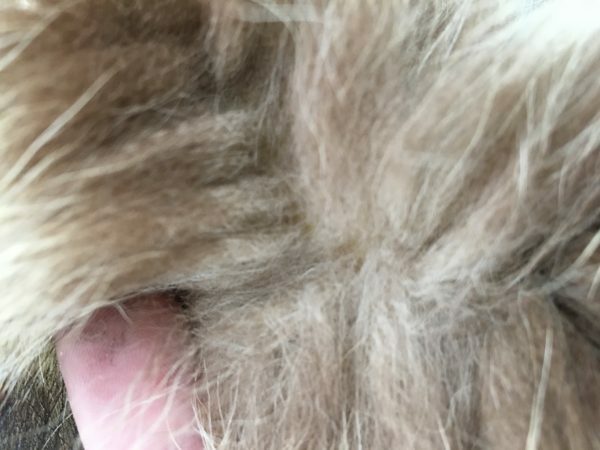 When you look at the pile of the fur, the seam is indistinguishable. When you pull the pile away you really have to look for the join. This is what you want in fur seams, be they faux or fox. Let’s say that, for whatever reason, you want to eliminate some of the bulk in the seam allowances – maybe the pile is too dense or too long and the join looks awkward. In cases like this, the correct thing to do it to trim away the pile slightly within the seam allowances. 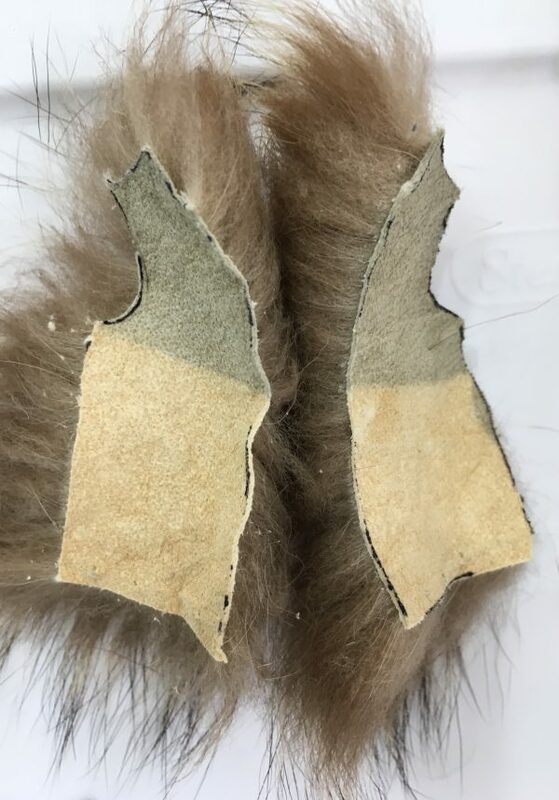 You will not want to trim all the way to the seam or past it unless you want to create a visible channel in the pile when seen from the right side. This is when specialty tools come in handy. 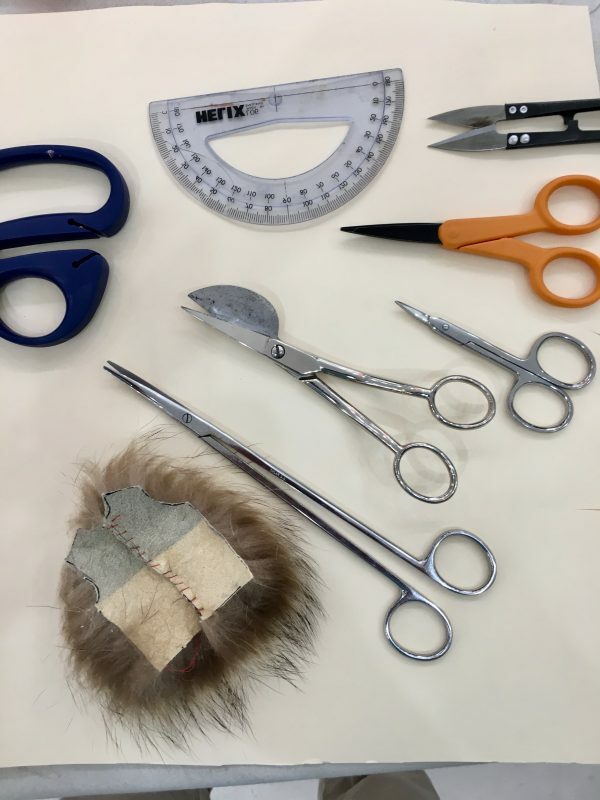 We like to use a curved surgeon’s scissors (lower left) primarily for this kind of work, using the appliqué scissors (second from left) the rest of the time, and using the other snips and small scissors for little pinchy details. Something with either a bent handle or a curved blade is going to help you get a clean precise cut. And that’s about it for today! Keep a vacuum handy for the little strays, but if you are thoughtful and careful you won’t be finding stray fur all over the place for weeks after the project ends. 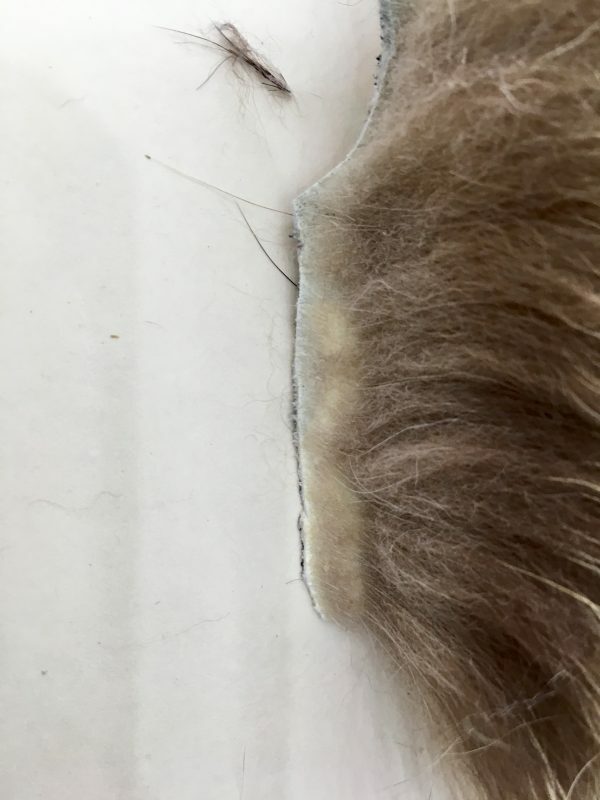 So we are aware that fur hides can be problematic and some people take umbrage at it. 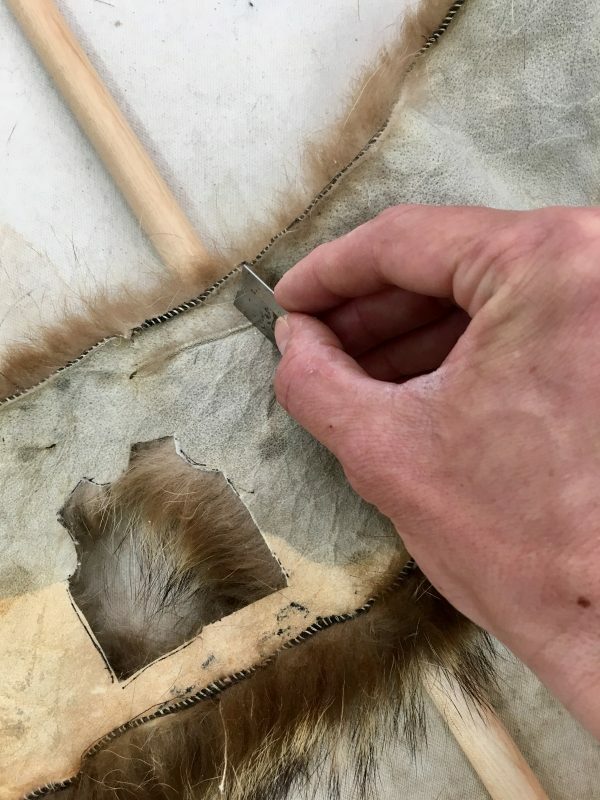 If it helps at all, this particular piece of fox pelt was left over from a fox restoration that Tchad did years ago and the scraps from this demonstration will be used and reused for other demonstrations before being composted or turned into fly fishing lures. 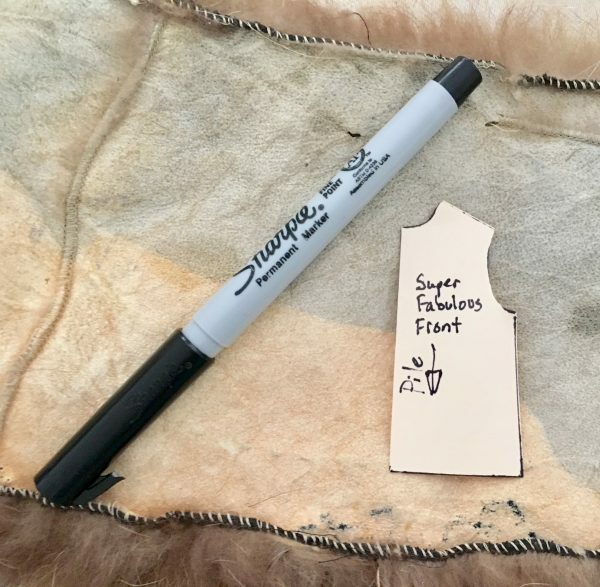 While we aren’t against the use of fur per se, we do think that it should be used wisely (if that is a thing) and not wasted and then trashed.